Wondering how to start working with more agents? We asked brokers for the qualifications they seek and inspectors for the strategies they employ. But before we get into tips for home inspection marketing to realtors, let’s establish why such marketing may be beneficial. Research suggests that home inspector-realtor relationships benefit inspectors. According to the National Association of Realtors® (NAR), 88 percent of buyers and 89 percent of sellers purchased and sold their homes through realtors in 2016. While many buyers and sellers do their own research to find home inspectors, it’s common for realtors to make recommendations. And most of the time, those recommended inspectors get the job. In 2001, NAR and the American Society of Home Inspectors (ASHI) commissioned a study that revealed that 69 percent of home buyers nationally chose their home inspectors based on their realtors’ recommendations. So what’s in it for agents? Linda J. Page, National Association of Realtors® Region 2 Vice President—which covers New Jersey, New York, and Pennsylvania—states that having multiple home inspector relationships is to the advantage of the realtor. Her company recommends clients more than one home inspector to give them a choice. In her 47 years of experience, she’s found that it’s important to base recommendations on inspectors’ characters and approaches. Thus inspectors benefit from having differing personalities to meet the needs of a dynamic clientele. 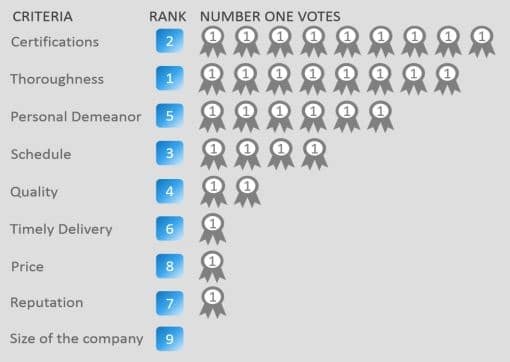 According to our interviews and HomeHubZone‘s 2015 survey of 160 realtors, thoroughness, certifications, schedule, and demeanor were realtors’ top criteria for inspectors. (See below.) We will talk about personal demeanor in an upcoming post. For now, we share what the agents we interviewed had to say about the other top criteria. Bill Gassett is a realtor at RE/MAX Executive Realty in Massachusetts and self-published an article entitled “What a Real Estate Agent Wants From a Home Inspector.” In our interview, Gassett stated that any relationship between a realtor and a home inspector should be a “win-win” for the client. “If I’m working for a buyer, I want to make sure that they have a great experience and obviously a home inspection is a big part of it,” Gassett said. Attention to detail contributes to that great experience. Thorough inspections allow buyers to make more informed decisions. And the more accurate and complete the inspection, the less surprises when the buyers move in. “We want the home inspector to provide a thorough, comprehensive inspection so that the buyer can make an informed decision as to whether or not to move forward,” Page said. In order to be thorough, Page believes that home inspectors need to be qualified. Our research and HomeHubZone’s survey suggest that agents seek similar qualifications in home inspectors. If there are any state licensing or certification requirements, brokers look for those first. Other optional certifications and training can indicate expertise. Finally, realtors look at how long inspectors have been in the industry, placing value on experience. Realtors’ expectations may seem to favor seasoned inspectors. While that’s partially true, new inspectors with technical backgrounds remain likely hires. “If somebody has been in the HVAC industry for 30 years but has now decided they want to retire from that business and get into home inspection, then we know that they’ve got some street credibility in terms of looking at those kinds of systems,” Page said. Many real estate agents want home inspectors who can inspect on short notice. Any more leeway than a couple of days, and the realtor’s more likely to refer another inspector. “The advantage to having a good working relationship with a home inspector is that, if you get in a pinch, and you need a home inspection in a very short period of time—especially during busy periods—the relationship may have an impact as to their ability to squeeze you in,” Page said. For many brokers, timeliness is a priority for not just scheduling but report generation. 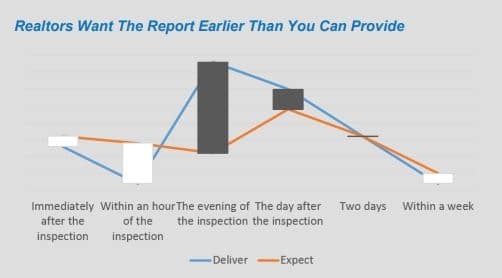 According to HomeHubZone, 35 percent of the 160 realtors they surveyed expected inspectors to deliver reports within an hour. Such an expectation seems extreme. However, it’s important to know that many realtors want reports earlier than inspectors provide them. As a home inspector, Paul Stratton, Owner of Stratton Inspection Services, LLC in Arizona, finds that realtors worry about potential claims. Many are concerned that, if the home inspector they refer to the client misses something, they’ll be liable. Stratton calms brokers’ nerves by explaining that his InspectorPro insurance policy protects them, too. Recognizing how he could use referring party indemnification as a marketing tool, Stratton designed a presentation for realtors about it. By educating real estate agents about the benefit, Stratton opened himself up to more realtor relationships. There are many additional topics about which inspectors can present. In fact, the internet is full of completed home inspection presentations ready to download. And if none of the presentations online fit your realtors’ needs, you can create your own as Stratton did. Jim Brown is the owner of Final Word Inspection Services in Georgia and the author of the article “Do You Trust Home Inspectors?” in REALTOR® Magazine. According to Brown, it’s critical to offer your services to your agents often. “I’ll go to the office, and I’ll stop at Dunkin’ Donuts. And I’ll grab them 24 donuts and just take them in and restock my business cards,” Brown said. Other times, Brown has taken real estate agents out to lunch or stopped by just to chat. For Brown, his persistence has paid off. In one instance, a realtor called Brown after someone else’s home inspection. The property’s terracotta roof had been inaccessible. Thus the other inspector was unable to determine the roof’s condition. So Brown offered to survey the roof with his drone, which he did. Stratton keeps in touch with existing and introduces himself to new realtors by sponsoring and attending broker events. For instance, sponsoring local BOLD events has allowed Stratton to network and learn. “I just try to sponsor the stuff that’s really going to bring me a lot of business and pay for itself and more. Because if you capture one realtor, they know 50 others that they can refer you to,” Stratton said. Other inspectors and marketing professionals recommend using technology for outreach. 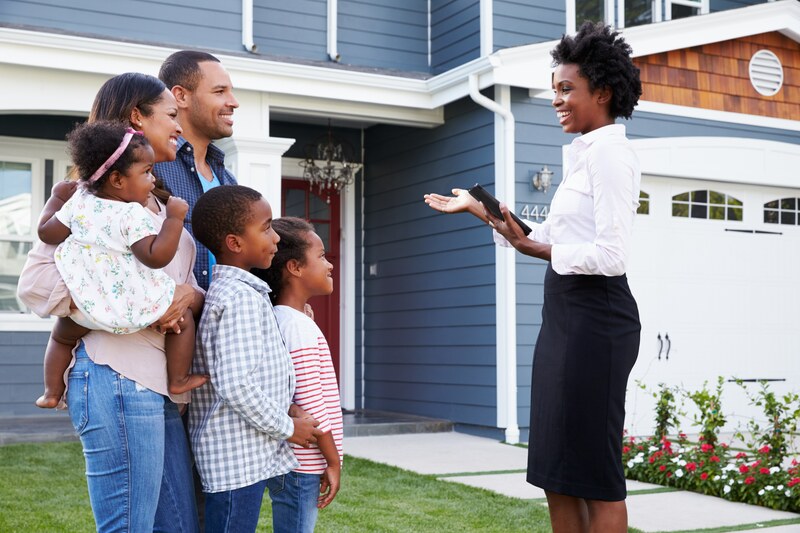 According to a recent blog post by Full View Home Inspection Marketing, following up every realtor-inspector interaction with an email helps, and engaging with realtor listings can keep inspectors top-of-mind. Daniel Cullen, Owner of Domicile Consulting, LLC in Chicago begins his relationships with realtors in the field. Cullen isn’t alone. His strategy of accruing and maintaining realtor referrals by example is becoming more common. Offering a quality service and giving clients a good experience can make agents want to work with you more frequently. The above article has been corrected to reflect that, when she was interviewed, Linda J. Page had 47 years of real estate experience—not 40.